Greek food in Vancouver is as monotonous as the fall/winter/spring rain in the city. The only thing that differentiates one rain system from another is the volume of water that fell from the sky. Similarly there is very little to distinguish one Greek eatery from another except for volume and maybe quality. Innovation, whether it be a creative new dishes or new way to present an old favourite, is what makes food exciting but it seems to be lacking in the Greek restaurants in town. It was a nondescript Vancouver downpour that brought me to Nu Greek in Gastown. I was getting too cold and wet from walking in the rain. I abandoned my original plan and ducked into Nu Greek for lunch. I was pleasantly surprised by the lamb wrap and soup I got on my first visit. I was offered a choice of either plain, whole wheat and oregano pitas for my wrap and I opted for the herbed one. Upon my completing my order, the pita was brushed with oil and heated up on a griddle. The pita was not the thin pocket I was accustomed to seeing in most gyro takeout places and grocery stores. Instead, this bread did not have a pocket, was hefty yet it had a pillowy soft texture. It also had a nice buttery taste to it. I really like the pita as it added substance and taste to wrap instead of just being a serving vessel. The Nu staff used the pita more like a soft shell taco and made a U shape wrap. In side the wrap were large chunks of fresh tomatoes, diced red onion and chopped green leaf lettuce. The tzatziki sauce was boldly garlicky with a faint hint of dill. The single lamb kebab that was place in the wrap was well seasoned and juicy. 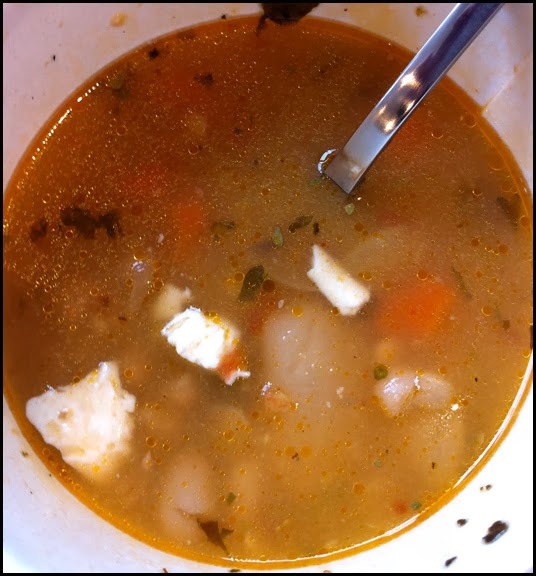 The 2 bean soup was hearty and tasty. I guess to make it Greek, staff added some salty and sour feta cheese to the bowl. The cheese provided a nice punch of flavour. I liked my impromptu visit to Nu and returned to try their lunch plate, which I thought was a great value. 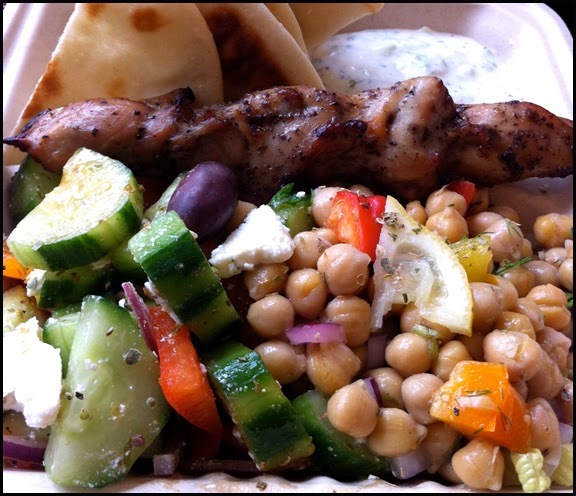 The special consisted of 1 meat skewer, a small Greek salad, a small chickpea salad, tzatziki sauce and griddle pita bread. Initially I thought they overcooked and dried out the chicken skewer, but it was moist and was well marinated. Many of the elements that were apart of the wrap, were the same in the lunch plate. The bread was soft, the tzatziki was full of garlic and the coarsely chopped vegetables in the Greek salad was fresh. What stood out for me was the chickpea salad. It had a lot of flavours going on. The beige round lentils were mixed with minced mint, diced red onions and bell peppers. The whole ensemble was dressed, I think, simply with lemon juice. 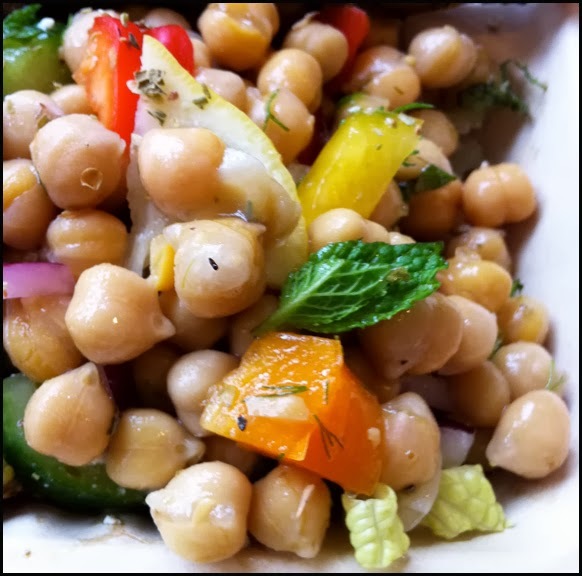 The dominant flavour was the earthy chickpeas, but the mint, onion and peppers gave the salad pops of spiciness, sweetness and an herbal component. However the key was the lemon juice as its tartness helped brighten up the chickpeas. For Greek food, Nu’s fluffy pita bread and chickpea salad felt novel and fresh. I don’t think either items will set the world on fire but in the staid Vancouver Greek food scene, they stand out as I don’t think I’ve encountered either in other Greek places. Due to the chickpea salad, pita, soup and overall quality of the food, I think I will add Nu Greek in Gastown to my weekday lunch roster of restaurants. In particular, my rain out list: above average eateries within a 5 minute walk from my office that I can quickly pop into if it’s raining cats and dogs, which it does a lot in Vancouver. Next Post Food Rumble: TORTAS! TORTAS! TORTAS!